If you’re cold, put a sweater on, if you’re warm, take the sweater off. Isn’t it about time the sweater does some work for you? Lots of gloves and hats promise high-tech thermal regulation but never, until now, has there been a fabric that changes its insulating properties based on its environment. 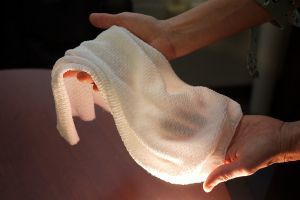 Now, University of Maryland researchers have created a new kind of fabric which does exactly that. Their research, published in the journal Science, describes their fabric which allows more heat to pass through it in warm, moist conditions (like those of a sweaty body) and which reduces heat escape in cooler, dryer conditions. The secret to the fabrics behavior is in its string. The yarn is made from two different synthetic materials coated with carbon nanotubes. Because one of the materials absorbs water the other repels it the fabric warps when it comes in contact with water, like sweat. This helps open the fabric’s pores while also bringing the carbon nanotube coating closer together. The distance between nanotube strands acts sort of like an old television antenna, changing the way the fabric interacts with radiation, in this case, the heat radiating from a human body. There is still more work to be done before the fabric can be commercialized, but according to researchers, the process wouldn’t be difficult. The materials involved in making the base fibers are already readily available and the carbon nanotube coating can be applied during any standard dying process. Even so, the fabric may be worth the wait. The process by which its pores are adjusted to the environment is so quick it could be heating a person up or cooling them down before they even know it. It may mean a future without intraoffice thermostat wars, and that’s a future worth waiting for.